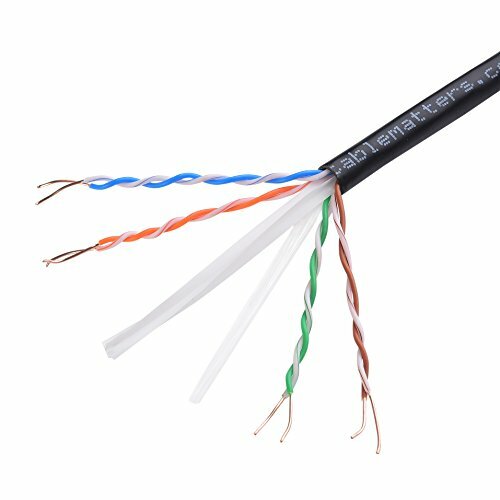 The Cable Matters Cat 6 UV-Resistant PE 23 AWG UTP Solid Bulk Cable is the perfect choice for installing weatherproof security IP cameras outside the home or office. Designed with a flexible and UV-resistant LDPE polyethylene cable jacket. A moisture-resistant PET thermoplastic polymer tape provides an inner shield liner for outdoor installations. This outdoor-rated bulk cable offers Category 6 performance in compliance with ANSI/TIA/EIA 568-C.2 to support 10 Gigabit and 10/100/1000 Ethernet networks. Supports Power over Ethernet (PoE) and Voice over Internet Protocol (VoIP) applications. Constructed of 23 AWG solid bare, pure copper conductors with a cross-web divider for enhanced performance, lower insertion loss, and cross-talk reduction.